Originally uploaded by ralphsanchez.Many, many years ago, man dreamed of flying like a bird. 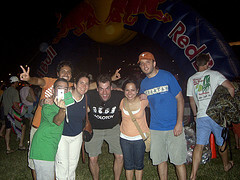 Countless people shared the dream.In order to pursue this dream, the Flugtag was invented. An event in which the brightest engineering and scientific minds come together to test their latest attempts at the elusive flying machine in front of a knowledgeable crowd.Yesteday, we had one of said events here in Austin. A bunch of friends and myself headed to the Auditorium Shores park to check out the different flying machines. I must say, none of them flew, but I strongly believe that the advances we saw yesterday put us closer to this ancient dream of finally having a man fly inside a machine of his creation, like a bird.See some photos of the event, courtesy of many people at Flickr.com.I also uploaded a short video with some of the attempts, but Youtube.com didn’t manage it very well, so I’ll reencode and upload again shortly.